With a length just shy of 19.5 feet, the SS Agile Type B motorhome from Roadtrek provides a homelike ambience on a nimble Sprinter 2500 van chassis. This compact Type B has great appeal for those who want the conveniences of a passenger vehicle with the amenities of a motorhome. Ah, the joy of being able to take a motorhome where most other motorhomes can only dream of going! Such is possible with the versatility and ease of handling of a Roadtrek Type B motorhome, the best-selling Type B since 1990. Though perhaps not as popular as its big brother “” the regular Sprinter-based RS-Adventurous “” the SS-Agile is tied for second place in popularity with two of its other siblings, the Chevrolet-based 190-Popular and 210-Popular. This success is most likely the result of the strong consumer acceptance of the Sprinter chassis coupled with a Mercedes-Benz power plant, not to mention the affordability provided by a highway mileage rating of around 23 mpg. One of the first things one notices about the SS-Agile is its sleek exterior, complete with stylistic touches usually found on the “high end” designs of much larger motorhomes. Our subject model is housed on the 144-inch-wheelbase Sprinter 2500 van chassis powered by a 3-liter CRD Mercedes-Benz V-6 turbo-diesel engine. Yes, this vehicle embodies style and class with enjoyable convenience and ease of operation. At an overall length of only 19 feet 5 inches, the SS-Agile packs a lot of features into a compact vehicle with only a 45-foot (curb-to-curb) turning radius. Indeed, this unit handles just as easily as any stock van or SUV (and much easier than some), but it is fully equipped as a self-contained motorhome. Able to seat up to five people and sleep two in twin beds or in a king-size bed, the SS-Agile is more than just a passenger vehicle. With an open, airy feel, this motorhome is perfect as a daily driver or for extended RVing. I was somewhat taken aback by how comfortable I felt immediately upon entering the vehicle. The SS-Agile struck me as being the perfect combination of people transporter and motorhome for two. During the past couple of years, I have come to appreciate the Mercedes Electronic Stability Program (ESP) on my personal car. It’s a must-have for me on the steep hills found in and around rainy Seattle. Well, with the Mercedes-Benz-powered Sprinter chassis, the benefits of that technology can be enjoyed aboard the SS-Agile. ESP senses the vehicle’s load and employs tighter traction control and antilock braking during wet or slippery conditions, before handling control is diminished. Having that feature on a motorhome? Priceless! A favorite feature of mine is the electrically operated rear sofa bed that remains standard fare on the SS-Agile. The sofa provides three seat-belted positions for use during travel, in addition to the two captain’s chairs up front. But with the push of a button, the sofa becomes a king-size bed (or twin beds) with plentiful storage below, accessed easily through the rear doors. The galley features an engineered granite countertop with a recessed cooktop that includes a glass cover. A three-way (120-volt AC, 12-volt DC, and LP gas) 3.8-cubic-foot absorption refrigerator is mounted below. A microwave-convection oven is built in below the counter as well. A recessed cover expands the work surface when the sink is not needed. The optional 19-inch flat-screen television is installed in the rear sleeping/sofa section but is affixed to a swing pedestal for easy viewing from the full-swivel captain’s chairs up front as well. 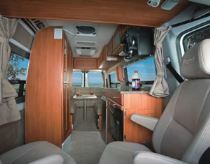 All of this contributes to a compact yet comfortable, full-featured motorhome. Access to campground connections for fresh water, shore power, and sewer are enclosed in a custom compartment on the driver’s side, along with the 10-gallon propane container and an exterior showerhead. A macerator pump liquefies the solid waste so that the sewer connection consists of a simple 1 1/4-inch hose. No more cumbersome 3-inch hoses to stow. The auxiliary house batteries are enclosed in their own compartment on the passenger side. On the Sprinter-chassis SS-Agile, two 6-volt batteries wired in series provide the 12-volt-DC power needed for extended excursions. A stock 750-watt inverter/charger provides 120-volt-AC electricity as well as a three-step battery charge function when connected to shore power. A generator-ready compartment comes standard if you wish to add a propane-fired, 2.5-kw Onan generator. A roof-mounted, 11,000-Btu air conditioner keeps occupants cool in the summer. The air-conditioning unit also includes an electrical heat strip that can help to take the chill off the interior on cool days. A 16,000-Btu Suburban furnace keeps occupants toasty during winter excursions (albeit, above freezing if you intend to use the fresh water system). In between those two extremes, a 12-volt, thermostatically controlled Fan-Tastic Vent roof vent replenishes the fresh air inside. Two trusted names in the RV industry, Suburban and SHURflo, supply the SS-Agile’s water heater and water pump, respectively. One neat feature is an external propane connection with a quick-disconnect fitting for fueling a separate portable barbecue grill “” perfect for those tailgating get-togethers. Powered and heated, the twin parabolic side mirrors are fully adjustable and oversized for easy viewing. The SS-Agile has a list of other standard features, and additional options are available as well. Brand-new for 2010 are three bold and exciting new color schemes for this model: butane blue and gray; desert and charcoal; and moss green and charcoal. These join the already available white-and-gray and silver-and-gray color schemes. Take into account that Roadtrek performs not only the mandatory safety testing but its own voluntary testing, including rollover tests, roof crash tests, and durability tests. Couple that with the vision of a father, Jac Hanemaayer, who purchased the company (then Home & Park Motorhomes) in 1974 after having a Type B custom-built, and the dedication of his son Jeff, who serves as current chairman of Roadtrek Motorhomes Inc., and it’s no wonder that Roadtrek has about a 45 percent share of the Type B motorhome market. The company offers an industry-leading four-year, 48,000-mile warranty. Yes, combine Mercedes-Benz technology, a Sprinter chassis, and Roadtrek engineering history, and you’ve got an exciting and certainly doable option for a full-featured yet compact motorhome designed for a variety of recreational uses.